After 23 years of experimentation, Don Facundo Bacardi set the standard for all future premium white rum. 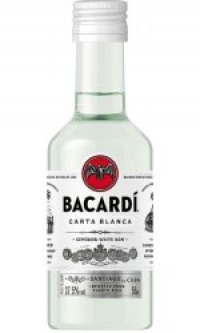 Established in 1862 in Santiago de Cuba Bacardi Superior Rum became the world's first premium aged white rum. To produce such a superior spirit Don Facundo combined the best of dark spirits production techniques (ageing and blending) with his pioneering filtration process (charcoal filtration, now used by other white spirits) to create the perfectly balanced mixing rum that neither overpowers nor disappears in your drink. Due to Bacardi Superior Rum's perfectly balanced taste it was used by cocktail pioneers as the principle ingredient in the birth of the world's best known rum cocktails including the Mojito (1860s), later featured in the 1931 book called Cuban Cookery, the Daiquiri (1896), the Cuba Libre (1900) and the Bacardi Cocktail TM (1917). Despite Bacardi rum and Coke being the world's most asked for branded spirit and mixer combination, its unique flavour is also great served over ice with a squeeze of lime and the mixer of your choice - orange juice, lime & soda, ginger ale or cranberry juice. UK & Northern Ireland - 3 day service £4.99. UK & Northern Ireland - Next day service £8.99. UK & Northern Ireland - Saturday service £10.99. Late deliveries up to 9pm during peak time (Christmas).